Eterna wood is selected for its special characteristics and beauty - only the finest will do. Heritage is then preserved by transforming each strip with the Permatech™ process, which combines modern technology, the know-how of our personnel and our love of wood. 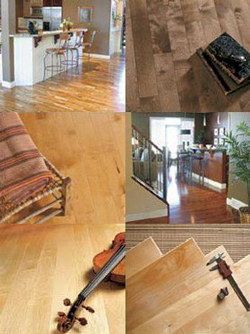 quality and consistency of each floorboard. Computer-controlled drying keeps humidity at an ideal level, between 6% and 9%, for long term stability. All strips are carefully hand placed in cartons for a final quality inspection. stability and a smooth surface. Panel sanding evens out the thickness of each strip for optimal uniformity. Floors can be re-sanded at least 5 times. Tongue and groove is adjusted on all four sides for long lasting and solid fastening. Small micro-beveled joints on all four sides of the strips result in an impeccably smooth surface. Eterna's exclusive Optima 100 finish provides protection against premature wear under normal residential use. The finish is applied to an optimal thickness of 100 g/m²: More can mask the beauty of the wood and less does not provide sufficient protection. The Optima 100 finish consists of several thin coats of polyurethane finish with aluminum oxide and ultraviolet drying for a more durable finish and a longer lasting shine. All strips are carefully hand placed in boxes for a final quality inspection.